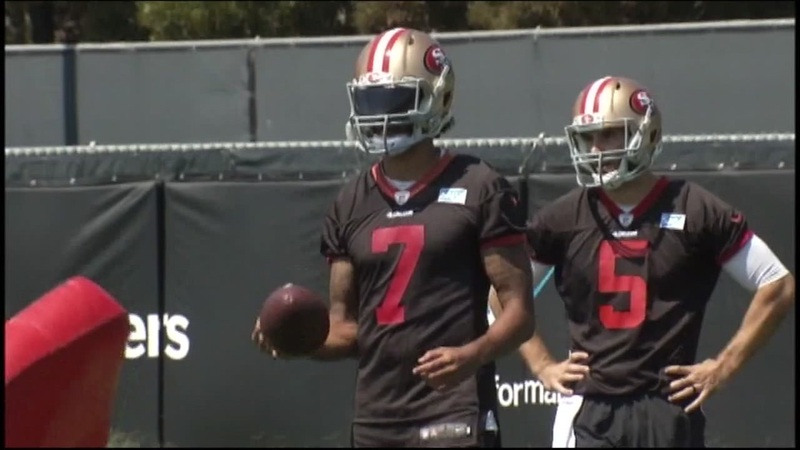 SANTA CLARA, Calif. (KGO) -- Santa Clara officials met behind closed doors to hammer out a plan amid an alleged threat of a police boycott at 49ers home games. The Santa Clara Police Officers Association said last week its officers may not work Niners games in response to Colin Kaepernick's protest of the National Anthem. But Thursday, all sides said they are now on the same page. Santa Clara Police Department Chief Michael Sellers, the officer's union and the local chapter of the NAACP all got together Thursday to talk about working together Monday night and beyond. The only person who wasn't there according to the NAACP was Kaepernick. "He's the Rosa Parks of this era. He has started something, a conversation across this nation that can't be denied," pastor Jethroe Moore said. The president of the San Jose-Silicon Valley NAACP bought a number 7 49ers jersey in support of Kaepernick and he's asking the quarterback to meet with police. "Mr. Kaepernick, if you get this, please I'm just a nobody trying to tell somebody how we can all get along," Moore said. Moore is the one who called a meeting with Santa Clara's police chief and the police officers association. He was glad to learn officers will continue to volunteer for shifts at Levi's Stadium. "From what I've been told and from what I see and our conversations, the officers are going to show up just like they've done for the past two years and provide a high level of service," Sellers said. Kaepernick has been refusing to stand during the National Anthem. The Santa Clara Police Officers Union initially responded by saying officers might choose to not provide security at 49ers games. In a letter to Santa Clara's mayor, the police officers association wrote: "We will encourage and support our officers to continue to voluntarily work at 49ers games." The police chief says there was never going to be a boycott. "A lot of it is, I think politically motivated, which I can't play. I'm here to serve the people of our city and that's exactly what I'm doing." Sellers said. The NAACP plans to send a letter to Kaepernick.